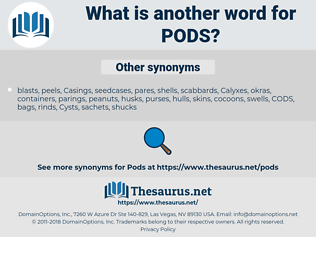 What is another word for PODS? PDD, DPA, DDA, LFP, DFT. Capsules, groupes, canisters, modules, groups, groupings, embankments, documents, Constituencies, quarters, tutorials, packages, vouchers, attachments, petits, components, aggregations, Airbags, Selections, clusters, hatchlings, rooms, cushions, Boats, Dives, segments, stripes, Bandages, vignettes, ramets, TAPES, pieces, panels, exhibits, Patches, drifts, Cartoons, stools, flocks, tanks, swarms, fuentes, parts, Puppies, Clips, feeds, audiences, SPARES, pews, litters, vessels, PUPS, desks, fountains, pits, materials, charts, gangs, supplies, Schools, MARAS, bends, sources, SHOALS, berths, rolls, blocks, Benches, Beds, strips, caps, caucuses, Coins, fonts, Tribes, swaths, chicks, vials, bundles, foils, bars, Buffers, banks, cans, Drives, Plays, peaks, Calves, items, stretches, packs, VATS, bunks, bins, bands, tracts, tubs, Baths, webs, CUBS, LANES, Unities, units. 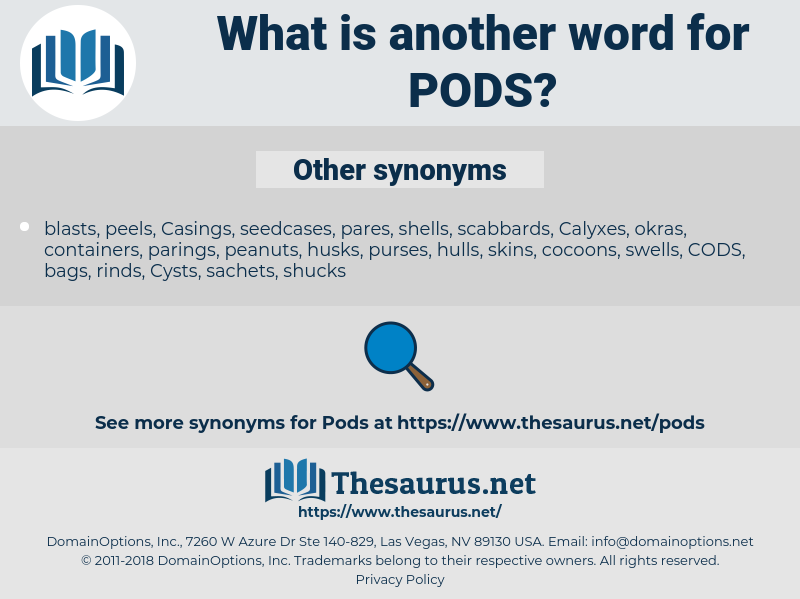 nacelles, cocoons, cloves, baskets, Cells. It bears a prolific crop of large beans, from two to five in each of its squat pods, but they are, as Mr Standfast found the waters of Jordan, " to the palate bitter, and to the stomach cold," and require special treatment in order to eliminate a poisonous principle. It took him all the afternoon to get all the pods across the river. peaty, phd, piety, pat, puffed wheat, pith hat, puttee, pay out, pedate, pet, putty, phaeophyta, pahautea, poppy day, poitou, pt, puff out, pop out, pip out, puffed, patty, pot, piute, potato, poppet, put away, pout, pate, petty, pythia, patio, Pee Dee, pid, pd, paiute, peyote, PDA, paved, peabody, pedwood, poop out, pitta, putout, pay heed, peewit, pittidae, payday, pathway, pitot head, Ph.D., peat, pitahaya, pithead, popeyed, pad, paddy, path, pupate, potty, putt, pipit, pipidae, pita, padded, peeved, pith, pit, petitio, pud, poet, pivot, puppy fat, PTO, paid, padda, pitot, pipette, puppet, pipet, potto, petite, put to death, phot, padua, photo, pied, pothead, pewit, peptide, put, put out, pitted, ptah, pea pod, pieta, pity, potted, pitt, papeete, pood, pie-eyed, pithy.